DIE Saturni, 17 die Novembris. Harvey's Petition, concerning a Decree in Chancery. The House resumed the Debate which was Yesterday, concerning the Proviso to be added to the Bill against importing of Irish Cattle; for giving Leave to import Twenty Thousand Head of Cattle, which the Kingdom of Ireland intends as Charity to the City of London. The Question being put, "Whether a Proviso shall be brought in, by which it shall be provided, That the Charity intended by the Kingdom of Ireland for the Relief of the City of London shall be brought over in Dead Cattle?" The Question being put, "Whether, in this Proviso, Care shall be taken, that this Charity so brought over shall be distributed in Specie to the City of London?" Their Lordships, or any Five; to meet at Five of the Clock this Afternoon, in the Prince's Lodgings. 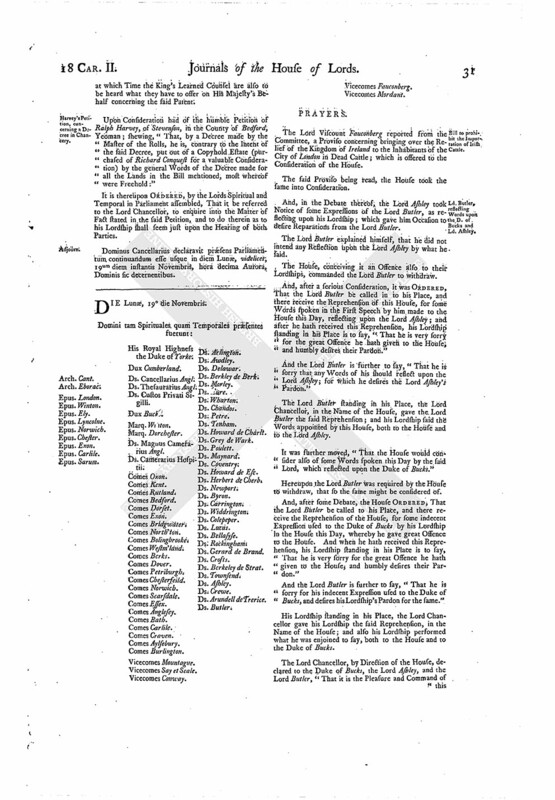 ORDERED, That the Committee appointed to consider of the Bill for illegitimating the Children of the Lady Anne Ross shall meet on Monday next, at Three of the Clock in the Afternoon; and the Duke of Bucks, the Earl of Westm'land, and the Earl of Anglesey, are added to the said Committee. 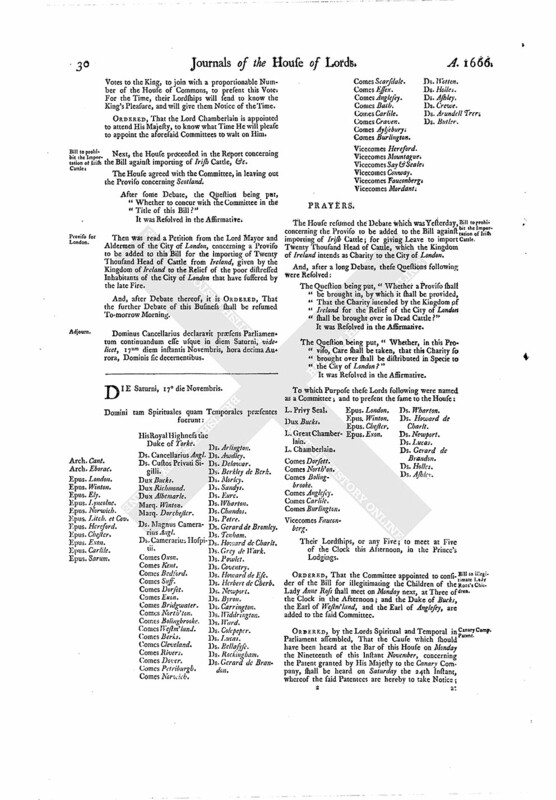 ORDERED, by the Lords Spiritual and Temporal in Parliament assembled, That the Cause which should have been heard at the Bar of this House on Monday the Nineteenth of this Instant November, concerning the Patent granted by His Majesty to the Canary Company, shall be heard on Saturday the 24th Instant, whereof the said Patentees are hereby to take Notice; at which Time the King's Learned Counsel are also to be heard what they have to offer on His Majesty's Behalf concerning the said Patent. Upon Consideration had of the humble Petition of Ralph Harvey, of Stevenson, in the County of Bedford, Yeoman; shewing, "That, by a Decree made by the Master of the Rolls, he is, contrary to the Intent of the said Decree, put out of a Copyhold Estate (purchased of Richard Conquest for a valuable Consideration) by the general Words of the Decree made for all the Lands in the Bill mentioned, most whereof were Freehold:"
It is thereupon ORDERED, by the Lords Spiritual and Temporal in Parliament assembled, That it be referred to the Lord Chancellor, to enquire into the Matter of Fact stated in the said Petition, and to do therein as to his Lordship shall seem just upon the Hearing of both Parties. Dominus Cancellarius declaravit præsens Parliamentum continuandum esse usque in diem Lunæ, videlicet, 19um diem instantis Novembris, hora decima Aurora, Dominis sic decernentibus.